Raspberry Pi is a simple, open and a series of credit-card sized single board computers. Learning platform that engages both the software and hardware worlds. The Arduino Robot is the first official Arduino on wheels. The robot has two processors, one on each of its two boards. Intel has discontinued Intel® Galileo development boards, Intel® Edison compute module and developer kits, Intel® Curie™ modules, including Arduino 101* (branded Genuino 101* in some countries), and Intel® Joule™ compute module and developer kits. Find support, documentation, and guides below. exercise moves, kung fu moves, dancing, and much more! The compact external dimensions simplify installation, whilst optional incremental/EnDat encoder feedback interfaces allow compatibility with a wide range of motors. Invertek's renowned motor control capability ensures maximum ride comfort under all conditions, with five independent S-ramps and dedicated motor holding brake control algorithm allowing fine tuning of the system. Elevator Variable Frequency Drive also incorporates Safe Torque Off* as standard, and a range of features including Rescue Mode. The GSM shield 2 is compatible with Data only and Voice and Data SIM. GPRS and SMS are supported by 2G Data only SIM, while voice calls, supported by the hardware, require a Voice and Data SIM, the same you may use in a GSM mobile phone. The Data transfer is based on GPRS technology and therefore it is not compatible with 3G or UMTS only network providers. GPRS is a 2G technology. It is recommended that the board be powered with an external power supply that can provide between 700mA and 1000mA. 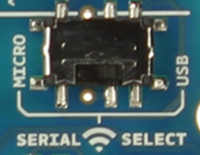 Powering an Arduino and the GSM shield 2 from a USB connection is not recommended, as USB cannot provide the required current for when the modem is in heavy use. On: shows the Shield gets power. Status: turns on to when the modem is powered and data is being transferred to/from the GSM/GPRS network. Net: blinks when the modem is communicating with the radio network. The shield comes with a on-board audio jack as well, and it can be used for both microphone and line inputs. It is also possible to make voice calls. You don’t need to add a speaker and microphone. There are two small buttons on the shield. 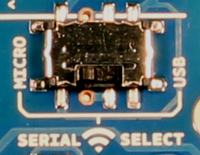 The button labeled "Reset" is tied to the Arduino reset pin. When pressed, it will restart the sketch. The button labeled "Power" is connected to the modem and will power the modem on and off. For early versions of the shield, it was necessary to press the power button to turn on the modem. Newer versions of the board will turn the modem on automatically. 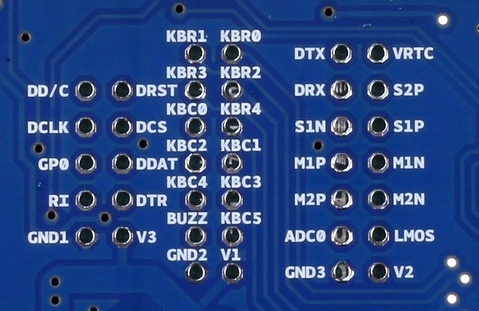 If you have an early version of the shield, and it does not turn on automatically, you can solder a jumper to the CTRL/D7 pad on the reverse side of the board, and it will turn on when an attached Arduino receives power. 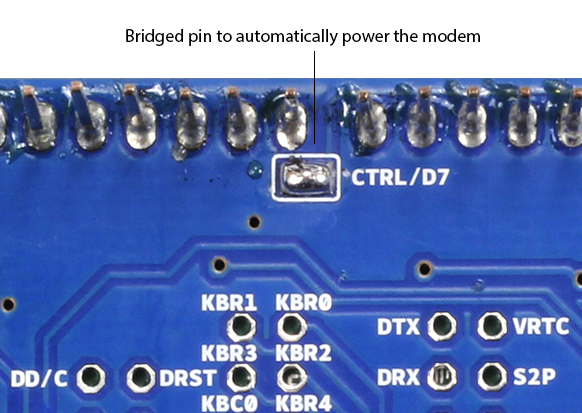 Several of the modem pins are exposed on the underside of the board. These provide access to the modem for features like speaker output and microphone input. See the datasheet for complete information. Do you own a past an old version of this product? Check Arduino GSM Shield V1 product page.